Tom had an extra day to join me in the California desert after Matthew had driven home at the end of the long Presidents' Weekend. Without any particular objectives in mind he let me choose, prompting me to serve up one of the DPS peaks in Riverside County. This would allow me to climb something Evan (who would be joining me in two days) had already climbed while getting me closer to that rendevous south of Joshua Tree on Thursday. 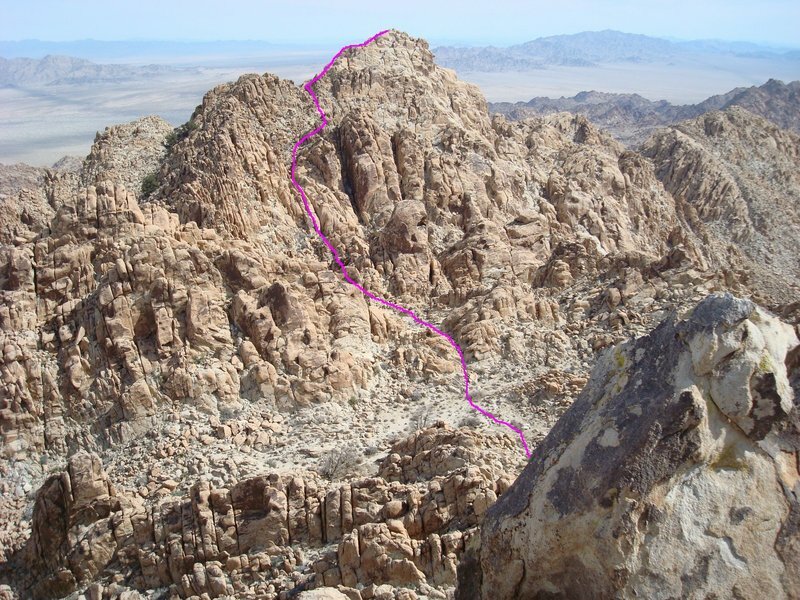 Spectre Point is the highpoint of three prominent pinnacles in the Coxcomb Mtns at the northeast corner of Joshua Tree NP. Along with the other two which the DPS calls Tensor Point and Dyadic, the three have also collectively been called Aqua Peak, referring to the USGS benchmark located atop Tensor Pt. The 7.5' map shows Tensor to the be the highpoint, but in fact Spectre is higher by some 70 feet or so. Dyadic is the second highest, coming in just below the height of Spectre. The approach from the north used to be a lot shorter before 1994 when the Wilderness boundary was extended, enlarging the monument, newly rechristened as a national park. The DPS guide was rewritten to account for this, but the latest (fifth) edition is still incorrect in describing an additional half mile that 4x4s can drive on a sandy road off highway 62. In fact, the Wilderness boundary is staked across this road and it is necessary to park just off the highway to begin the hike. Doing just this, we started off shortly after 8a with beautiful weather. We followed the road up a flat wash basin towards the base of the Coxcomb Mountains, taking an hour and a half to cover the distance across the desert floor. This was the cost of having the expanded Wilderness boundary, but we weren't complaining (that much) about it. It was warmer than it had been the previous days, almost too warm, and we were wishing we had started a bit earlier in the morning. A breeze would pick up as the day progressed, keeping the temperatures fairly mild. As our route curved to the southeast, we followed the wash into the base of the mountains, taking a right branch off the main wash in order to follow the DPS Route "B." The steep slope and saddle above were fairly obvious, and soon enough we were scrambling out of the wash.
We were working up a good sweat by the time we topped out on the saddle some 15 minutes later, the boulder work to get there being rather enjoyable. Expecting, or rather hoping, that the route would be similarly obvious on the south side of the saddle, we were quickly disappointed. The terrain now before us was a jumble of granite boulders and pinnacles, all looking very much alike. None of the higher pinnacles about us were the actual highpoints we were looking for, though we didn't discern this immediately. We started up a ramping side canyon to our right, heading towards the highest things about us that we could see, only to realize about ten minutes later that we'd taken a wrong turn. As we began to match the terrain to our map, we concluded that we needed to head down from the saddle rather than up, and decided to drop down from our higher perch through a class 3 rock wall below us. A few ducks in the bottom of the canyon gave us confidence we were back on track, and turning to the southwest we eventually found our way up the north side of Tensor Point. It was 11:15a when we reached the summit of Tensor Point, where the AQUA benchmark is found. The other two points were not far from us, across a shallow canyon to the south and southwest. A register found at the summit clearly indicated we were not on the DPS highpoint - Spectre Point to the southwest. The earliest entry dated to 1966. Among the last few entries from the spring of the previous year, were the names of Evan Rasmussen and Rick Graham, two familiar climbing partners. Like us, they had not gone straight to Spectre Point, first stopping at Tensor Point. We wondered if we would find they also visit the much harder Dyadic which I hoped to finish off with. We stayed atop Tensor about 15 minutes before heading for Spectre. Though it looked like it might take an hour to traverse the rocky landscape between the two, it took us only a third that time, the route being obvious and not all that difficult. In the Spectre register we found Evan and Rick among the last few entries as expected, along with a host of familiar names: Kathy Wing, Doug Mantle, and others. Happy with our progress so far, I almost immediately turned my attention to the last of the three, Dyadic. Tom had been uncertain up to this point as to whether he would try the last one, so I used the "Oh, I can see the route from here," lie to lure him into the adventure. I joked that we had to get one up on Rick and Evan, whose footsteps we seemed to be following. It worked like a charm. And though I had significant doubts about what I was actually looking at for a route, it turned out to be mostly correct, something more attributable to luck than eagle-eyed route-reading skills. We descended off the blunted East Ridge of Spectre Point, easy class 3, and then followed a route south of an intervening pinnacle on our way to Dyadic. This led us up some more serious class 3 rock, stymied at one point with a small 15-foot drop off. Some of the rock was permeated with weathered holes that looked like they might make for good holds to drop from. Exuding confidence I suggested the obstacle would be easy to overcome. Tom had his doubts, commenting that the rock didn't look to solid. I took a kick at the rock which almost immediately crumbled, spilling sand and pebbles below. It seemed the thin rock was little more than compressed, weather-beaten sand. Not all that good to hang from when your continuing health is at stake. Eventually we found a way down with the aid of a convenient pine tree growing nearby, then continued over to the northwest side of Dyadic at a narrow saddle. Though we had almost no beta on Dyadic other than what was in the DPS guide (It is a harder climb than either Tensor or Spectre Points, being high 3rd class by its easiest route), we didn't know where this easiest route was. Immediately before us was a 20-foot chimney that looked climbable with the aid of a 6-foot rock leaning inside the feature. It certainly looked harder than class 3, but since it seemed within our abilities, we decided to give it a go and hope for the best above, rather than try to hunt around the base of Dyadic for an easier way that might chew up a lot more time. Once atop the chimney (which proved easier than we had expected), we found a tricky combination of fun scrambling that included more chimneys, friction sections, and an airy jump. It had us wondering up to the very end if we were actually going to make it to the summit, and the result was one of the more interesting summits I had found among the desert peaks to date. We were elated to finally make the top, though I admitted to Tom I was going to be nervous until we were back down off the upper half of the peak. There was another register found atop Dyadic just like the previous two, though this one had fewer entries as we expected. Though Evan's name wasn't found in it, Rick Graham's was, and we had to take back the jokes we'd made earlier - we certainly had nothing on him this day. We retraced our route back down Dyadic to the narrow saddle on the NW side without mishap, actually finding it easier upon the descent - probably because it lacked the apprehension of whether the route would go or not as we found on the way up. From the saddle we dropped off to the north, then angled down around the north side of Dyadic to the base of the NE Face. This face looked almost vertical for more than 100 feet, but with many folds of rock that made it look climbable, perhaps at the low class 5 level. It certainly would be worth a future effort to explore it. Descending to the canyon between Dyadic and Tensor, we then turned east, following the canyon downhill for the next hour. This was the DPS Route "A," which we intended to follow in order to make a loop of our wandering through the range. The distance down the canyon was barely more than a mile, but because it was taking us so long to cover the distance we had begun to worry that we overshot a key junction. We had a GPS with us but, expecting an easy route-finding effort, had not downloaded any waypoints. While we let the GPS acquire a signal, we looked over our map (which was the page out of the DPS guide) to try and decipher the coordinate system. The left and bottom margins had small and large numbers in combinations that looked vaguely like degrees and minutes, but somehow lacking for the longitudinal values. Eventually we reckoned them to be in UTM coordinates, a set neither of us had much familiarity with, but by playing with the GPS settings we were able to finally get the two navigational aids to agree and we concluded we were indeed at the correct junction. Turning northwest, we followed a wash up and over a broad saddle, leading us to the north side of the range. Continuing down the other side, we were surprised to find a lone hiker taking a break in the middle of the wash. It was 3p by this time, a fairly late hour for someone to be heading up to Spectre Point. In the ensuing short chat we found he was not out climbing at all, just hiking up a random canyon for an afternoon of picture-taking. By his closely cropped hair and bulging biceps it was easy to guess he was a marine from the base at Twentynine Palms, taking the afternoon off to visit the area. We pushed on down the canyon, by now fairly broad and sandy at the bottom, eventually meeting back up with the side canyon we had taken on the way up for Route "B." As the weather was quite fine and neither of us in any particular hurry, we stopped often to take pictures of the minute flowers that were just beginning to make their appearance about the desert scene. Blues, purples, and yellows all made an appearance in the landscape. It was 4:30p by the time we returned to SR62 and our vehicles. Tom and I shared a well-deserved cold one while we packed our gear and had a few last words before departing. After shaking hands, Tom headed back to the Los Angeles area and home, while I drove to Twentynine Palms to get a room for the night. I planned to venture further into Joshua Tree the next day and this location would make for a short drive in the morning. I came down the NE side of Dyadic, and didn't find anything easier than low 5th class with a fair bit of backtracking. Also, the rock quality frequently sucked -- more of the compressed kitty-litter that seems so abundant in this area.